What a weekend! PeachFest 2014 started off with a Boom, of thunder, that is. The first annual Palisade PeachFest Rockies Game, Wednesday, Aug. 13, scheduled to kick off the weekend, ended up being postponed till the next night due to rain. Not before a number of Palisade residents had packed and unpacked their Sunday Market booths under the Rockies grandstands, though, and lots of residents had gathered there to wait out the rain. 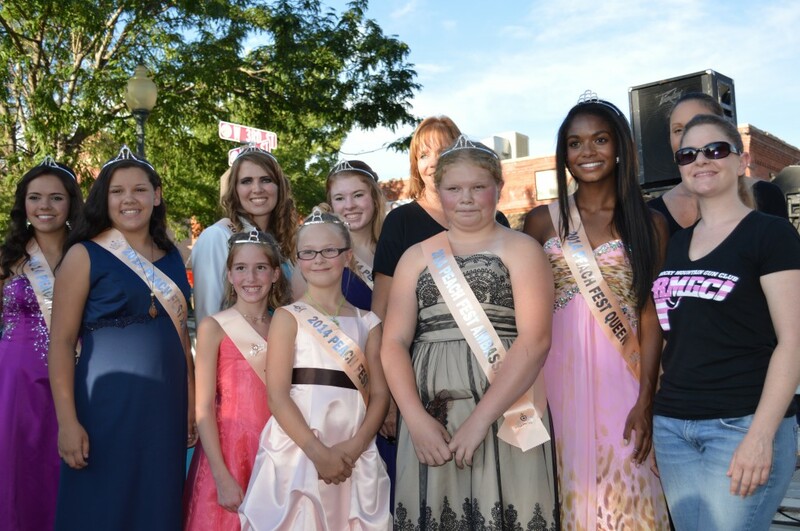 Our Peach Queen Princesses were on hand to greet arriving fans, as was Mayor Granat, scheduled to throw out the ‘First Peach.’ We’ll just have to try for next year! 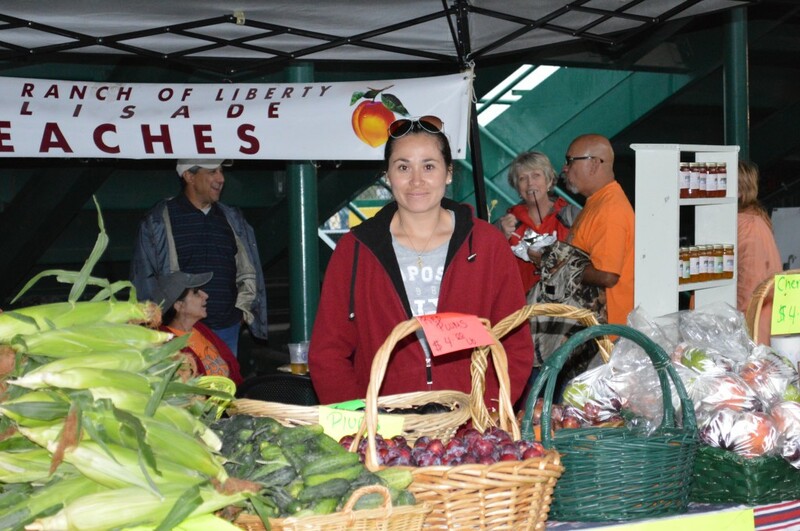 A few of Palisade’s growers set up their Sunday Market booths under the Rockies grandstands for Wednesday night’s game, a disappointing rain-out. 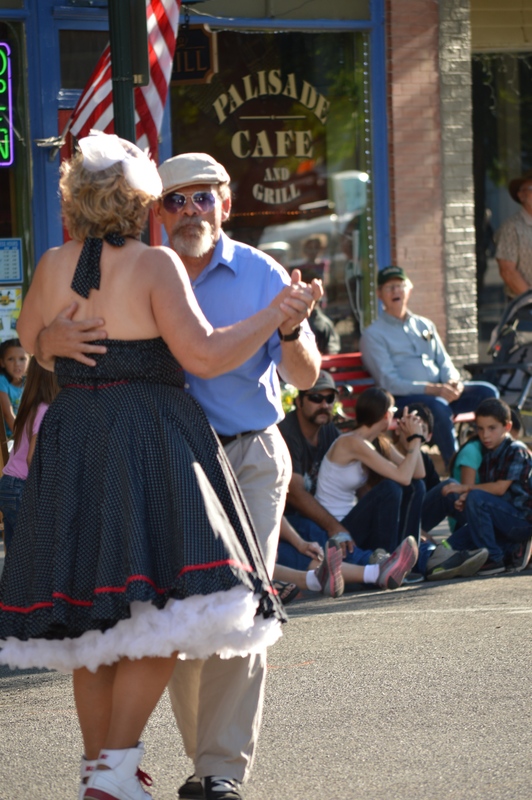 The next night, Thursday, was the traditional Ice Cream Social and Street Dance, and we couldn’t have asked for nicer weather. 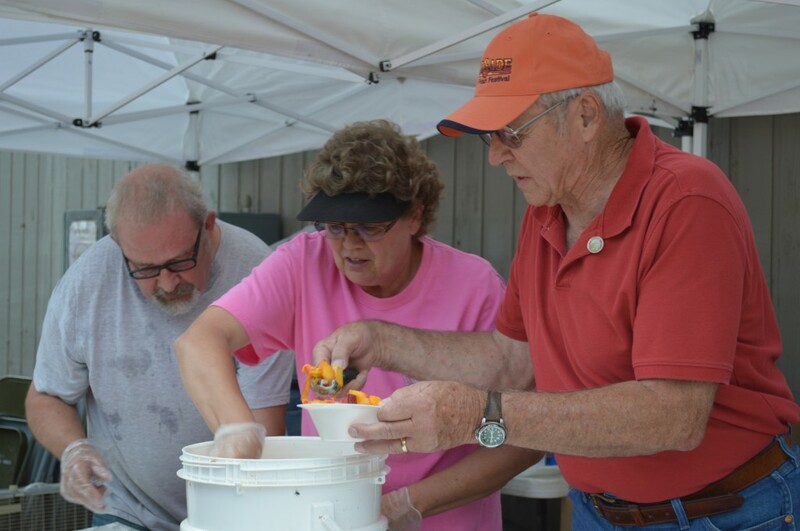 Members of the Board of Trustees and town staff members had been busy all day, slicing up generously donated peaches to serve over ice cream that evening, and when the Master of Ceremonies, Jake Jabs of American Furniture Warehouse, arrived for his peach sundae there were already hundreds of people joining him. Mayor Pro-tem David Edwards, left, Elaine Korver, and Mayor Roger Granat scoop ice cream to be topped with Palisade Peaches. Mr. Jabs then surprised and truly delighted the crowd by joining Palisade bandmaster Ron Koss on the stage for a couple of rousing country-western favorites. It turns out that Jabs, known for his TV commercials with tigers and other wild animals, is also an accomplished musician. Not only is he a great singer, he also plays Spanish guitar and slide guitar. Now that we’ve heard his talent as a singer, we’re hoping he’ll bring a guitar or two along as well next year. If I hadn’t been watching with my own eyes, I might have thought Johnny Cash was onstage. What an entertainer! This year’s Peach Queen, Bailey McCall, was crowned by Mr. Jabs along with other members of the Peach Court. This year’s Peach Queen Scholarship prize was sponsored by the Rocky Mountain Gun Club, a first for them as well. Bailey McCall, second from right, was crowned as the 2014 Peach Queen, here with her Court and sponsors from the Rocky Mountain Gun Club. 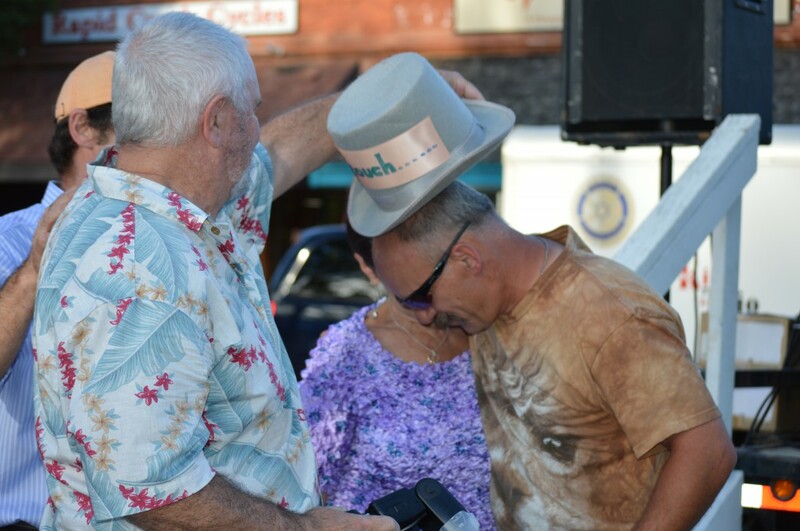 In a separate ‘coronation,’ Mike McDermott of Suncrest Orchard Alpacas took the honored Town Grouch stovepipe from retiring Grouch Jim Cox. Outgoing Grouch Jim Cox ‘crowns’ incoming 2014 Town Grouch, Mike McDermott of Suncrest Orchard Alpacas. Jim was seen making the rounds of the Ice Cream Social crowd, snarling and growling one last time before handing over the top hat. He kept trying to the very end, but if truth be told, Jim Cox just wasn’t very grouchy. Grouch On, Mike McDermott! 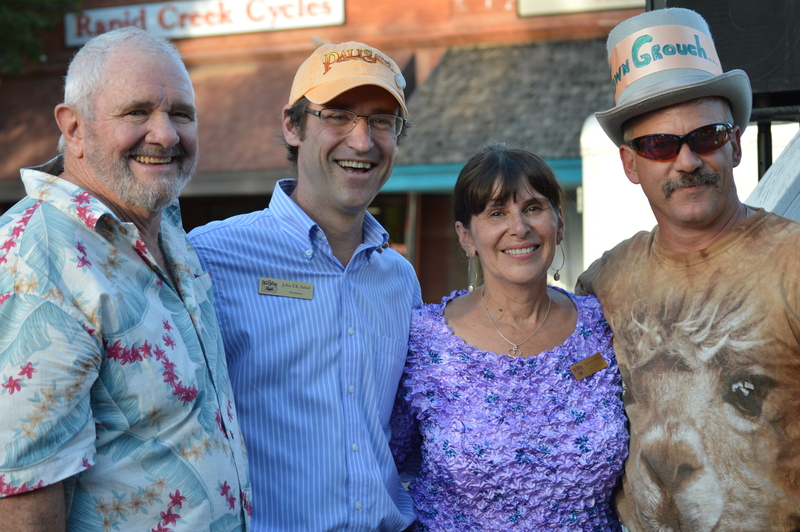 Outgoing Grouch Jim Cox, Chamber Chairman John Sabal, Chamber Director Juliannn Adams and New Town Grouch Mike McDermott at Thursday evening’s Ice Cream Social in downtown Palisade. 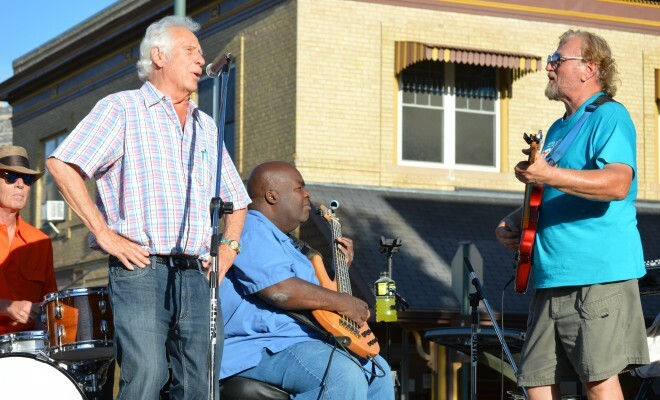 All in all, another great summer evening in downtown Palisade! nice pics, well done, thanks Betsy! !